US: US equities rose overnight, with the S&P 500 advancing 0.7% for a fourth straight session of gains. - Alphabet added 2% ahead of the release of the company’s quarterly results. - Events this week include the continuation of earnings season, with around half of the index already reported, President Trump’s State of the Union address tonight and a speech from Fed chair Jay Powell tomorrow night. EUROPE: Europe’s markets were mostly down on Monday, with banks leading the decliners and investors slightly more cautious amid a smattering of downbeat earnings news. The Stoxx Europe 600 slipped 0.1% to 359.23 after finishing up 0.5% last week. - Swiss bank Julius Baer Gruppe AG tumbled after announcing a series of cost cutting measures. LOCAL: The ASX 200 closed 0.5% higher at 5891. After falling to a low of 5848 in the morning, the index recovered in the afternoon on the back of the major banks ahead of the release of the Royal Commission final report. - Utilities and energy stocks were the best performers, up 1.6 and 1.3% respectively. The materials index was the worst performer with a decline of 0.3%. - The worst performer was Boral, down 7.9% to $4.55 after issuing a profit warning. - Wealth management companies like AMP and IOOF were punished, falling 1.3% and 4.5% respectively. Banking analysts said this was because of the corporate regulator's announcement this morning that CBA's financial planning arm would have to stop taking customers. 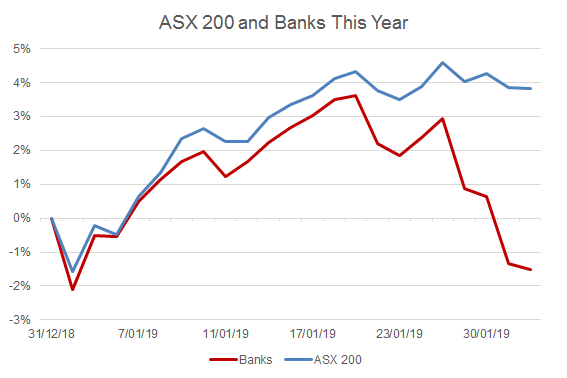 While the banks rose early in the year along with the broader ASX 200 Index, since mid-January the sector has underperformed in anticipation of the Royal Commission's final report. With the report released after the market closed yesterday, today could be a more volatile session for the sector as investors digest the report's recommendations.